Publisher: Sports Pub, Champaign, Illinois, U.S.A. The San Francisco 49ers shaped the NFL throughout the 1980s with their unique blend of precision, panache, and preparation. Two decades later, NFL teams are still copying the system and the methods that made the 49ers unlike any other organization in professional sports. Running back Roger Craig exemplified the qualities that have produced five Super Bowl titles for the franchise. Craig starred in three of the 49ers' Super Bowl wins, helping set the tone in practice with his nonpareil work ethic. During his eight seasons with the team he was one of the most productive players in franchise history. Roger Craig's combination of skills was something never before seen in professional football. In 1985 he became the first player in NFL history to top 1,000 yards rushing and receiving in the same season. He used his knee-churning, eyes-wide-open style to earn four trips to the Pro Bowl and score a Super Bowl-record three touchdowns in one game. After finishing his career with the Raiders and Vikings, he signed a contract with the 49ers in 1994 so that he could retire as a member of the organization. To this day he remains a 49ers icon who is as well respected by the current team as he was more than a decade ago when he was charging through opposing defenses. 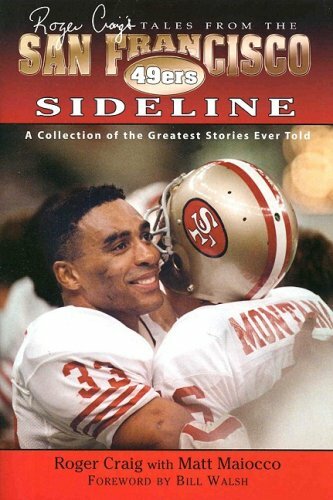 In Tales from the San Francisco 49ers Sideline Roger Craig uses his trademark vision to capture some of the moments that defined the organization during its glory years. Included are stories about all of the men who shaped the direction of the franchise, including such luminaries as Bill Walsh, Joe Montana, Steve Young, Ronnie Lott, Jerry Rice, and George Seifert. Fans will relive all the great moments and read some never-before-toldstories from a man kept his eyes open to everything during his fascinating career. Recapture all the excitement of 49ers football-newly updated!